My daughter Hayley and I playing…. 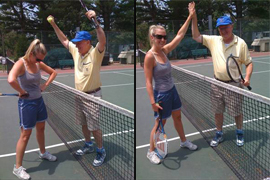 Traditional Competitive Tennis versus Collaborative "Ten Tennis"
For over 25 years now, my family has been playing a game we call “Ten Tennis.” My wife Jo Ann came up with the idea of “cooperative” tennis when we were playing the game with our young kids as they were growing up. Tennis can be awfully frustrating when two players have vastly different abilities. Hearing “40 – Love” over and over again is no fun for anyone. Most of the time is spent running around picking up tennis balls. So we came up with the idea of a cooperative form of tennis called “Ten Tennis.” Basically, you start off the same way as the traditional tennis game, serving the ball. After the ball lands in the opponent’s square for a legitimate serve, your opponent suddenly becomes your ally as the two of you work together to hit ten volleys back and forth across the net. Once you have worked together to achieve the goal of ten volleys, the game then becomes competitive to see who wins. If the ball goes astray before ten volleys (frequently the case), you just start over. There are several advantages: First, you spend more times playing than picking up tennis balls. Second, it helps improve the ability of the novice player. Third, it is just as challenging for the better player to place the ball where the opponent can return it as it is slamming it in an unreachable corner, and you get just as much exercise running around the court trying to return the volley. Once you work hard to get to ten volleys, you can then have a competitive round. Both the cooperative part at the beginning and the competitive part at the end are lots of fun, and nobody seems to get angry or frustrated. Try “Ten Tennis” – you’ll like it!